2. Save games have their names changed due to some unintended editing of a record from the original author. I will fix both very late at night. Sorry! An updated main file was uploaded to fix the save game issue and also made the heels bigger and less weird looking. A big thank you to user Dova-joaquim for finding the error in the ESP and fixing it! The armor of the armor needs to have the armorclothing tag and also the armor type needs to say None instead of heavy or light. Your second question I don't understand. Not sure what's Elven about this, but nice outfit. 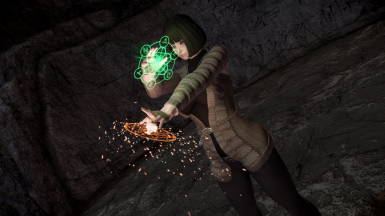 your character looks fantastic, which enb are you using to achieve such effect? You are quite talented at clothing design and modelling/texturing. Placing the items in the game world is not the best. Depending on mods loaded they can disappear, fall through the earth or go flying. Better to make them craftable ..... its not hard. You could also provide keywords in your description so they can be easily consoled OR recommend the great mod AddMenuItem. This will make it easier for people to see your great work. I noticed you use containers in the world space edits which is good but it still makes no sense why there'd be fashion Elvin clothing in a barrow....instead of just complaining I made a version that has recipes that I'll send to you if you like. It would be your choice whether to have smithing requirements or reduce the values of the items. Thanks for the compliments but they are misdirected. I just only ported these to SE and CBBE SE. But this mod and all others I've ported were not my original work. In terms of your other statements. Don't worry, I know how to do all that. However, personally it gets cumbersome when you're running a highly modded game and have to sift through 500+ outfits in the crafting menus. While you are right they can disappear, they only disappear if significant changes are made to the formid of the cell. Note, I said formid, not actual edits to the cell itself. From what I can see in Skyrim SE and Skyrim LE nexus, there are no mods that alter the formid of bleakfalls barrow or helgen keep. So this mod are 99% safe. It's just personal preference really. I think it's more fun to find stuff in the game world instead of simply crafting. Any chance for an unenchanted version? Yes i can do that. Will upload in 6 hours. Oh, this is going to make my Altmer look fantastic walking around Solitude...and those sisters at Radiant Raiment are going to be so jealous LOL.